Being born and raised in Boston, I remember a lot of my teen and younger years being spent hanging out around Chinatown, specifically the Castle Square neighborhood and the streets around Mass Pike Towers. Playing football, hanging out at friends’ houses and going to school at Josiah Quincy Elementary School and then the 6th grade school Josiah Quincy Upper School are mainly what my memories are composed of. The strange thing was that most of these memories of Chinatown were not actually in the “heart” of the neighborhood. Finding this peculiar when I was older, I turned to the best source that I had: my father who had lived in Mass Pike Towers since my grandparents first came to Boston as their permanent settlement in America in the 70s. He told me that Chinatown used to be a place that chewed you up and spit you out. What is currently a bustling neighborhood full of new bakeries and new restaurants used to be a dangerous and seedy place better known as the Combat Zone. 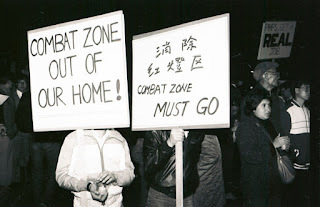 The Combat Zone, as it was so lovingly called, was given the appropriate name due to the looming presence of adult movie theatres, drugs and just overall gang presence. If you came for leisure, it wasn’t the same type of leisure found at Disneyland. During the end of the 20th century, the Combat Zone was starting to get cleaned up; adult movie theatres were being shut down, gambling dens were being busted up and local gangs were being infiltrated. Slowly, but surely Chinatown was being much safer to hang out with friends and family. It was becoming the type of place that you could walk through the neighborhood, find your favorite pho place and didn’t have to be afraid that you were in danger of being in the middle of gang rivalry between the Vietnamese and Chinese gangs. Ask any millennial that’s grown up in the area and they’ll probably stare at you with a face of confusion. The darker history of our neighborhood’s past isn’t exactly revered or even talked about much. I learned essentially that my memories didn’t involve much of the actual Chinatown because my parents still had the remembrances of the Combat Zone fresh in their mind. Understandably it was something they didn’t want their children associated with. Flash forward to the past 8 years or so, it’s a much different than it was in the past. It’s a neighborhood where you can go to the local market and grab baskets of choy for the hot potting at home you plan to do. It’s a place that I can walk through feeling safe at 10pm just to get some of my favorite milk tea and bao because of a late night craving. While Chinatown is always facing constant and different changes that many might not be happy of, it has come a long way, something that we need to remember and can’t forget. Being safe and having the ability to enjoy such a beautiful neighborhood that still has a lot of rich history should be something to appreciate. I actually grew up in Castle Court and the Naked Eye had two digits reversed in their phone number from mine.